Oregon players slap fives after the win over Hawaii on Friday night. HONOLULU — I came to the Islands to find out what kind of teams Oregon and Hawaii have for the 2019 season, knowing both could use a trip to the postseason after a few years of being ordinary to quell some of the restlessness of the natives. What I come away with as I climbed on that silver bird tonight to head back to the continental 48 is, both these teams seem to be trending in the same upwardly mobile direction. Yes, the breakthrough seasons that these programs are yearning for could be at hand, at least if the last two nights of games in any indication. Besides, both head coaches seem confident in that. Hawaii took game one on Thursday with a big late-inning rally, 7-6. Then last night the Ducks got revenge with a 3-1 squashing of the Rainbows. 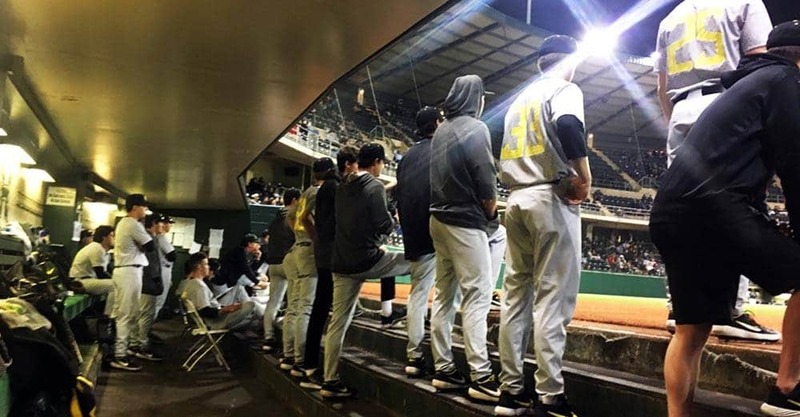 Oregon players watch their teammates in the field notch the last few outs in the ninth inning of a 3-1 win over Hawaii. A few things that jumped out to me about the day in college baseball. – All the unbeatens stay unbeaten. What a night for the perfect teams. But boy did they have some hairy moments. N.C. State, Florida State and Tennessee all had come-from-behind wins to stay unbeaten. Only Arizona State breezed, blanking Xavier 12-0. But to be fair, the Volunteers did have a little bit of an easy time as well despite falling behind Fresno State 3-0 in the first inning. The Big Orange rallied immediately, scoring four in the first and four in the second to make it an 8-3 win. The Wolfpack had a bit of a scuffle with Pitt, but eventually pulled out a 4-3 win. And FSU had a lot of trouble with Virginia Tech but J.C. Flowers’ earned the game-winning hit with a jog-off RBI double, emptying a bases-loaded situation and giving FSU the win in 10 innings. – Early candidate for the Ouch List: Cal. The Bears had the win over LSU in Baton Rouge, 3-2. Done. Over. HOWEVER, they fell victim to the worst rule in all of sports: the dropped third strike. With two on and two out, Tiger batter Hal Hughes struck out swinging, but the ball went to the backstop on a wild pitch to load the bases with still two outs. Then, All American Josh Smith cracked a single to centerfield, scoring two runs to pull out an unlikely 4-3 win to open that three-game series. In case you were wondering, five Tiger pitchers combined to issue eight walks, a hit batsman and a wild pitch. As a college baseball writer, sometimes you struggle to figure out if you should give a team big props for an impressive win, or do you give the other team a hash of crap for playing poorly and losing? Well this is one of those games where you do both; Nebraska beat Baylor 12-4 in a laugher in Waco, keyed by Angelo Altavilla’s two-home run, five-RBI outing and Luke Rascom’s four-hit, four-RBI night. The odd thing is the BU pitchers keep racking up the Ks, punching out 10 Nebraska batters in the game. That is the 11th time in 12 games that the Bears have produced double-digit strikeouts of their opponents. But they also issued eight walks and hit two batsmen along the way. NU is now 5-6, while BU falls to 9-3. The Hitter of the Day honors might just have to go to Dallas Baptist’s Bryce Ball, who pulled a Reggie Jackson in October by clubbing three home runs against a pretty good Oral Roberts team in the Patriot’s 13-8 win in chilly Tulsa tonight. For the fourth time in the last six games Auburn has blanked an opponent, this time disposing of UT-San Antonio 6-0 in the Friday lidlifter. Tanner Burns was the stud once again, going 7.0 innings, allowing just four hits and one walk with 10 punchouts of the hapless Road Runners. In his last two starts Burns now has 25 strikeouts and one walk in 16.0 innings of work. Oh, and this is the first time since 1949 that the Tigers have posted shutouts in four of their last six games. Cullen Kafka serves up another confusion-maker to the plate against Hawaii. As mentioned above, both coaches say they see their teams turning a corner this season and this weekend could play a big part in that. After two games of the four-game set the teams stand at a win apiece out here in Honolulu so far this weekend. Hawaii is a much more athletic team and is now capable of beating you in multiple ways. Oregon is also a different team this season, having added some speed and diversity and a little more “umph” to their roster. Both teams have enough pitching to make a run at the post-season. But both coaches expressed to me the need, nay the necessity, for their teams to stay out of the M*A*S*H unit. Injuries ruined the Rainbows last year, where in one mid-season week they lost three of their top four pitchers to injury. Oregon has a first round draft pick pitcher – Kenyon Yovan – sitting out right now and the coaches talk about how getting him back and him regaining his old form could be a make-or-break proposition for their prospects.